Hi all, are there any electronics guys with a MAN TGL ZBR module on the shelf can help me ? I have a ZBR that was blown up due to battery reversal , only fault i have now is low resistance on the supply line to the processor. I was hoping someone on here might be able to measure the resistance of the line for me so i can compare, if anyone can help please contact me. 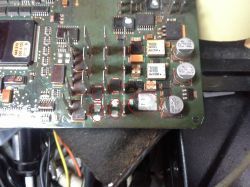 Open control unit and check these diodes. (big one is a tranzorb for sure) You may find more of them between pins. in the photo you see some missing, i remove those as spare parts. Most probably some of them are shorted. Charitou, many thanks for your replay. The voltage coming out of the other coil by the way is 14.5volts. My problem is; i don't have drawing so i do not know what the voltage at the GREEN dot should be and i do not know what is the correct resistance to ground at the RED dot. I suspect the MCU is shorted internally. Just power up the ZBR. you should have 5V there. If you have bench PSU, try powering up the point, with current limit to minimum. Gradually increase current carefully and inspect if any IC is heating up. Thanks again for replying but as i said before, i have bench power to the module & now after replacing the protection diodes you mentioned (including the big one) the power is not dragged down BUT as i said before, the 750ma fuse will blow straight away and the voltage at the fuse is 21.6volts (high) & the resistance of the supply to the MCU is just 6 ohms. Still got this module on my bench, does anyone have a circuit or can measure the voltages etc at the points mentioned ? Błąd ZBR 4121 w samochodzie ciężarowym MAN TGL.